Here’s my honest PB Comfort Slipcovered Sofa Review. 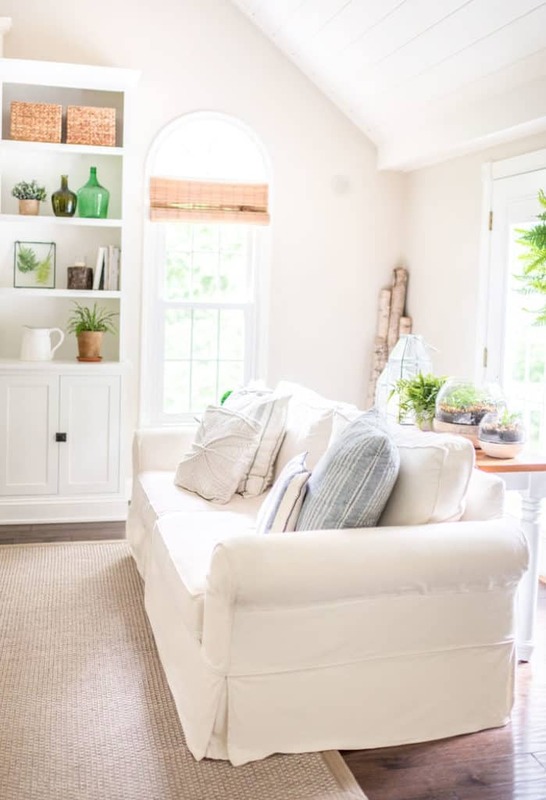 I share the pros and cons of having a light colored slipcovered sofa. Note: This post is not sponsored by Pottery Barn, we purchased these sofas on our own. One of the questions I’m asked most often is my feelings about our light slipcovered Pottery Barn Comfort Sofas. I held off for a couple years on a full review so that I could answer the question thoughtfully and from the perspective of how well they hold up over time. The short answer is that I do like these sofas. They are super soft and comfy. When clean and fluffed, they are very pretty. I pined for them, begged my resistant husband, contemplated and schemed of ways to get rid of our puffy leather living room set (which was left over from his “man cave” and weren’t my style). About two years ago, PB had a rare slipcover sale, and we decided it was time… BUT with compromises, naturally. We would not get a “pure” white. He wanted brown, I wanted white: we ended up with “Natural Brushed Canvas” which is best described as a creamy off-white. We would not splurge for the performance fabric, as the price was already considerable. He wanted upholstered sofas, but I really thought slipcovers would be more practical with the kids. I agreed to wash the slipcovers monthly and keep them looking neat because he is not a fan of the rumpled look. After a couple of months, the sofas arrived. They were beautiful, clean and fresh, casual but structured. The whole room felt lighter. After years of brown leather that hid almost everything, I was suddenly side-eyeing my goopy children, but I was otherwise elated. Naturally, even though we’ve always had rules about not eating or drinking in the living room, there were almost immediately spills and stains. I was/am relaxed about it, kids are kids. My priority was that we balance enjoyment with style. I refused to be “that mom” who practically had plastic over her furniture. After all, it was my choice for our family room, and I knew what I was signing up for. I would just wash the slipcovers, as planned, right? I’m going to get to that in a minute. First, I’ll answer another big question I’ve gotten. Why not the popular and more affordable IKEA Ektorp? You know I love IKEA, and I find the Ektorp to be beautiful and a great value. We happen to own two. We have the sofa in our NH lake house and an Ektorp sectional here in our Massachusetts basement. They are fairly new, so we can’t speak to the longevity- but so far, so good. The foam of the cushions is actually a bit more substantial than the Pottery Barn sofas. They are definitely less comfortable right out of the gate, but I wonder if maybe they will hold up longer. Honestly, you really just can’t beat the price. It was the dimensions that decided us on the PB Comfort for our family room. Our room is very long and narrow with cathedral ceilings, and we knew we needed a large sofa to look proportional in the space. The PB Grand Comfort Sofa is both taller and longer than the largest Ikea Ektorp at the time (although Ikea has recently released larger Ektorps!). We also like the dimensions of the PB Comfort Grand Armchair. It fills up the corner perfectly. I know that there are other options out there, and we did explore those (both local and national). The prices were generally comparable, but we were unsure of the quality. 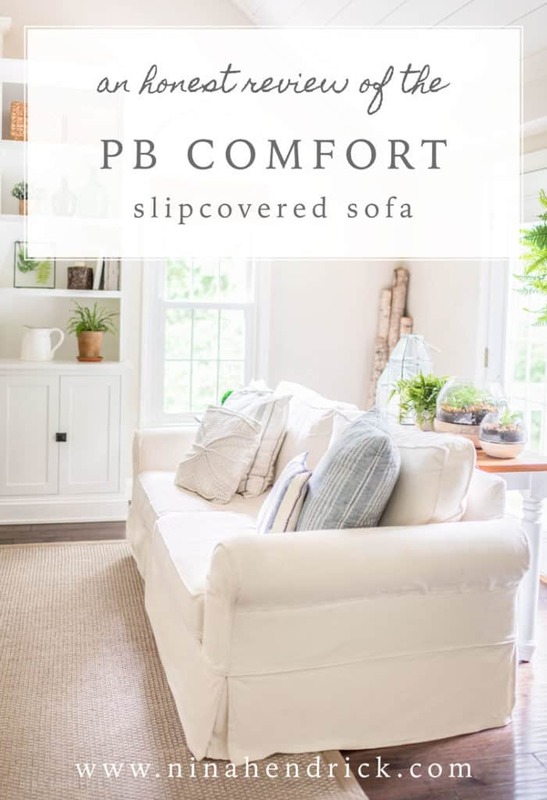 Ultimately, I decided I wanted to go with the PB Comfort because I love Pottery Barn, have purchased other big-ticket items from there(with positive interactions with customer service when needed) and it was the one that had always caught my eye. Was the PB Comfort Sofa worth the investment? I’m going to lay out the facts and my experience, and let you be the judge. I’ll start with the positive. The construction of the sofas and chair themselves is really sturdy and impressive. One thing I’ve heard from friends is that the EKTORP gets a little saggy after years of constant use. The frame of our sofas is very solid and, bonus: built in the U.S.A. The only issue we have had structurally is with the removable back cushions on the Grand Sofa, which is the one we use the most. The get really squished and flat (the kids completely abuse them, in all fairness). I believe they can be replaced later on. We’ve had the most problems with the slipcovers. Shortly after our big purchase two years ago, I washed the slipcovers for the first time, meticulously following the care instructions provided by Pottery Barn. I used cold water and gentle detergent. My machine doesn’t have an agitator. I laid the slipcovers out to air dry and brought them to the sofa to put on while they were still slightly damp. I thought I was going above and beyond the care instructions with the air drying since the care instructions actually said they could be put in the dryer on “tumble”. That seemed way too scary to me. As I attempted to muscle the damp slipcovers onto the sofa, It was immediately apparent that something went horribly wrong. The first thing that came to mind was Chris Farley in Tommy Boy… my sofa was a Fat Guy in a Little Coat. I repeated the same process with the second sofa, this time with the bonus of inexplicable splotchy discoloration… even though it had been washed the same exact way. It wasn’t quite as tight, but my second sofa suddenly looked like it was wearing high-waters. After some frustrated tears from me and a round of “I told you so” from Mack, I was on the phone with Pottery Barn customer service. I have always found their customer service responsive and professional. They were quick to make everything right on both sofas. They asked for me to email photos and after they reviewed them we were sent replacements expediently and without issue. Can the PB Comfort be Machine Washed? Judging by my experience and that exchange, I have my suspicions that these particular slipcovers may be safest when treated as dry clean only… which was not what I signed up for. I wanted something I could easily toss in the (cold) wash without a second thought. I know that this is possible with some slipcovers. I’ve had a white canvas slipcovered chair from Arhaus for 8 years that I’ve washed countless times. 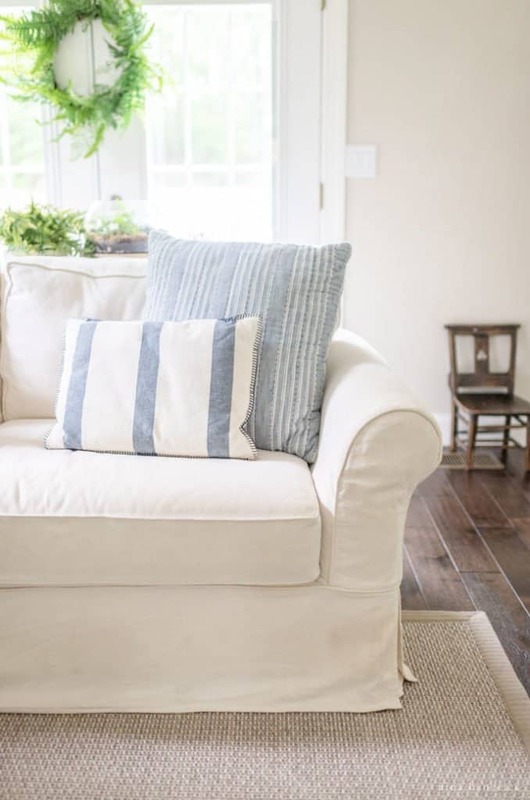 I didn’t even know about washing slipcovers in cold water at the beginning, but it looks as tailored and clean as the day it came home… All of this in spite of being a rocking chair for two infants and all of the spit-up and other messes that came along with them. I have even bleached it after an unfortunate coffee incident with perfectly fine results. That is what I was looking for, not to spend $300 every few months for dry cleaning (which is the average of the quotes locally). One of our replacement slipcovers (the one for the Grand Sofa) arrived just a bit large for our sofa. With that factor, I felt confident enough to wash it in cold water and lay it out to dry the first month after it arrived. It has been fine after several machine washes since (in cold water, following the initial care instructions). The other replacement slipcover seems to be a slightly different fabric. Although they are both brushed canvas, I’m guessing they changed suppliers between the two. It is very tailored, so I held off for as long as possible on machine washing it. We purchased the chair and ottoman a little later than the sofas, and they appear to be made of the exact same fabric as the second replacement slipcover. They are also very tailored. I spot treated all three of those pieces with my Bissel SpotClean Pro (I love this machine) until it was undeniable that it needed a full wash. Finally, I sucked it up and machine washed them, my fingers crossed the entire time. You can read here about how I keep the slipcovers looking neat and wrinkle-free. It went fine. Those slipcovers are a bit more of a struggle to get back on, even damp. They have not shrunk after a few washings following the original care instructions. All in all, YES, the whole maintenance thing was a “headache” completely of my own making. It’s also not a real problem in the grand scheme of problems. I totally get that. I would invest in the indoor/outdoor fabric. 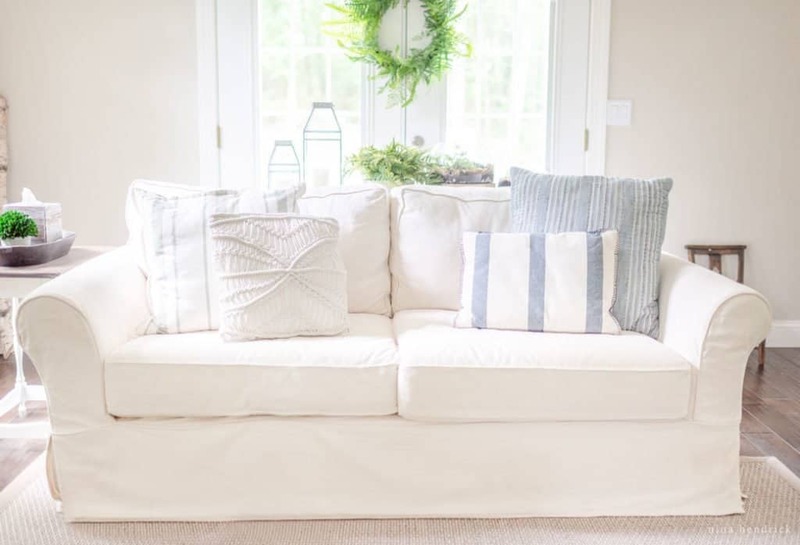 We purchased third-party slipcovers in a indoor/outdoor fabric for two mismatched sofas at our lake house (one being the Ektorp, one being a PB Comfort). I have been so happy with them. They look great, machine wash easily, and hold up to all of the sand, water, and even wet dogs. I think that would have been the perfect solution. Overall, I love the style of these sofas. The leather set will not be making a reappearance, it is happy (and looks perfect) in the home of our friends. I fully intend to continue to have light colored slipcovers in this particular room, which is low on natural light. Would you recommend the PB Comfort Sofa? So, as you can see, the FAQ of “Would you recommend the PB Comfort Sofa?” does not have a simple answer from me. My answer is: Yes, but with a different fabric choice. It may have just been a poor slipcover fabric choice for our situation. It may have even been a bad fabric supplier that they’ve since changed (the issue does seem to be fixed with the new slipcovers). I can only speak for my experience. Ultimately, you will have to decide if they will work for you. Great review here, and seems like maddening results with washing those slip overs. I had arhaus sofa and large swivel chair and after a couple years I didn’t like the tweedy fabric anymore (seemed a little scratchy). 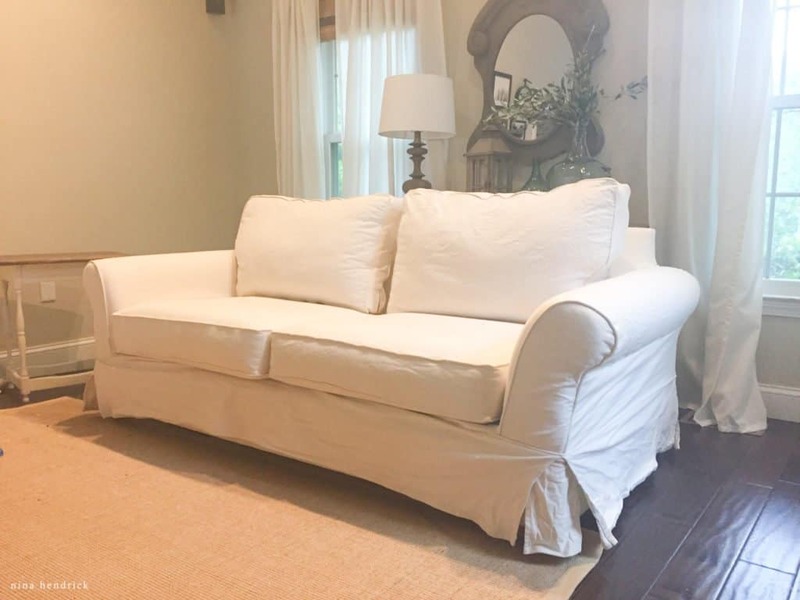 I bought white duck cloth slip overs from arhaus And they are fabulous. I throw them in washing machine and in dryer (otherwise they wrinkle like crazy). I envision having those for a long long time. When it comes to furniture I am a firm believer spend the money on seating. You won’t regret it in the long run. The seat cushions are still awesome! Thanks for this review. I rely heavily on reviews when I make purchases of items I expect to keep a long time. 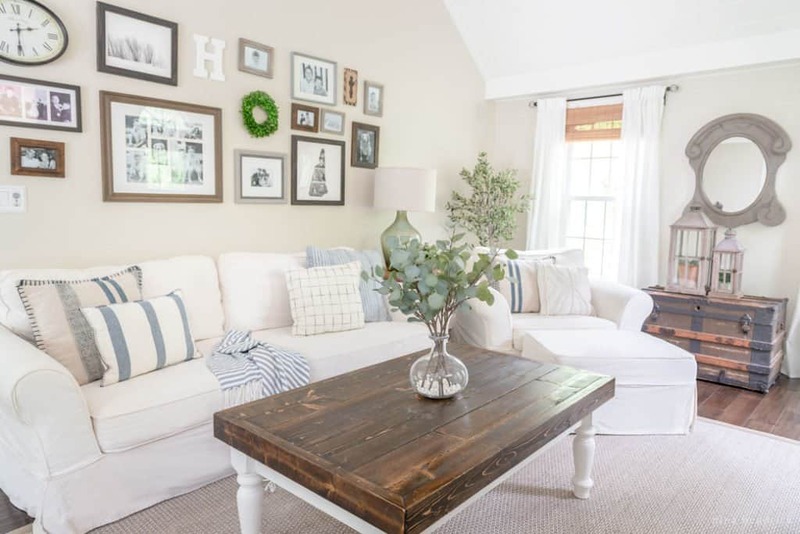 I think your family room looks very light and airy although you said it doesn’t have much natural light, so your chooses must be working well for catching light. I have this exact couch from Pottery Barn. I love it! I wash my slipcovers often and while they are a pain to get back on they always look beautiful. I use Clorox 2 for any stain removal- even hair color one time- and stains always come out. I would buy this couch again but I think I would go with white! It is so easy to clean. So glad you’ve had such great luck with it, Robyn! I own this sofa. It is my first pottery barn sofa. I am AMAZED at the poor quality!! Yes you heard me. After one short year, all comfort is if not gone, at least very diminished. I bought white denim, and was told how easy it was to clean and to get spots out…..LOL… Such a disappointment. I’m sorry to hear you had such a bad experience, Mary! Ours is still very comfortable, at least, but it’s unfortunate to hear about another fabric choice that doesn’t clean very easily. Last year I purchased new slipcovers for our PB sofa and immediately noticed that they fit loosely. I assumed that this was to allow for shrinkage which I also had experienced with the original covers. After washing the cushion covers, I opened the washer to find they had unraveled and were tangled in large balls of string. Immediately I called Pottery Barn and after emailing photos and a description they sent me a new one. I was impressed with the customer service. Months later I washed the replacements and they did the same exact thing. They do not surge the seams along the zippers and therefore they unravel. Obviously they have switched manufacturers since 2011 when I purchased the sofa. After many calls to Pottery Barn I was told not to buy the cotton slipcovers again because they would do the same thing. I was also told not to buy linen either. I asked what fabric won’t unravel and I was told to visit my local store where they could help me. If they know they have a problem why are they not fixing it? I am so disappointed since I wanted a washable light fabric. Quite honestly I do not think there will be much to choose. This experience has changed my impression of Pottery Barn. I no longer want to purchase anything from their store since they do not care that they are selling expensive items of very poor quality. I bought my on comfort in 2007 in washed linen. Its is a cream color and I love it. I have two small dogs and they normally only lay on the ottoman which I have a rectangular faux sheep skin on it to protect ottoman. I have washed cushions more often than the body and they still look amazing. The chair cover is showing a little wear on piping but nothing anyone else would notice. I am extremely happy with this sofa chair and ottoman purchase. I would never own any other sofa. 11 yrs later it still has not lost any shape. I bought another set of covers on sale but haven’t used them yet. The only thing I could complain about is the ridiculous cost of the replacement covers. I got them 30% off and they were 1600 for sofa chair and ottoman. That’s outrageous but I was afraid they would discontinue the covers or style and i wouldn’t be able to get new covers for my on comfort. I am sure I will get another 10 yrs since its not losing shape at all. I do know the performance linen gets balls on it if you don’t get 100% cotton linen. My daughter got cotton blend so it didn’t wrinkle but it did not hold up. Oh yeah. Be prepared to iron skirt after washing if you want linen covers. Do you (or any of your readers) know if its possible to put slipcovers over the PB upholstery sofas? B-I-L’s family is moving and we’re thinking about buying their upholstery version of this sofa. But like you, I like the idea of the washable slipcover. I don’t suppose we can buy a slipcover and put it over the upholstery? Hi! I haven’t ever done this specifically, but we ordered slipcovers from ComfortWorks that we’ve been very happy with, and I know they will do custom. No, You can’t, I asked the same question at the store, The upholstered version already has a cover making the dimension bigger. The material with which the slipcovered sofa is made it’s slippery to help when putting the slipcovers on. Maybe if you removed the upholstered covers, It’s possible, but it’s an expensive chance to take if it doesn’t fit. Can you tell me if yours is the memory foam? I have a sectional I LOVE but just ordered 2 chairs and a couch and had a freiend say how dissapointed she was with hers she got a couple years ago. Hi,great review. I’ve always wanted a slipcovered couch. You answered so many questions I had. Thanks again. Your awesome!!! Oh, oh. I’m getting a little worried! I have a Grand Comfort chair with a natural brushed canvas slipcover. I can’t remember exactly when I got it, but it’s been a few years. Maybe 4? Anyway…I’ve washed the slipcover several times, and it has turned out great! The chair is polyester. It does need “fluffing” often, but I love the look! 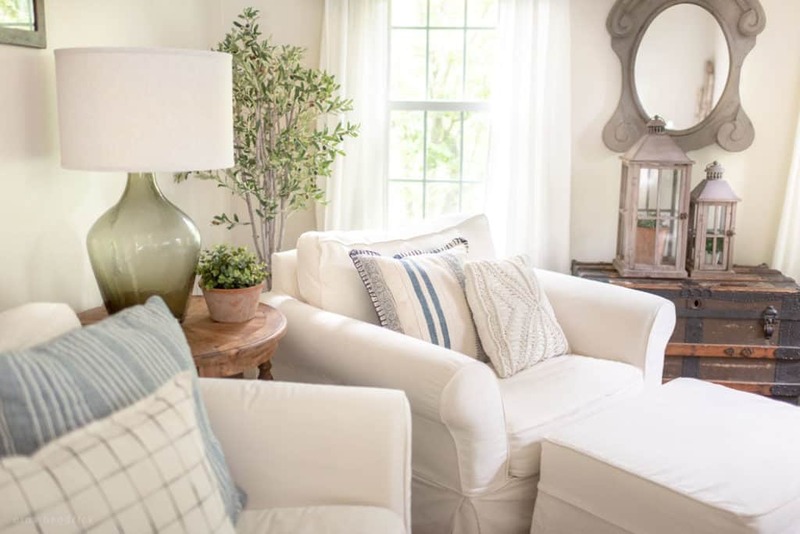 Fast forward…I just ordered two Pottery Barn slipcover couches in brushed canvas stone. I got the memory foam…partially because it was less expensive, and partially because I thought it may be less slouchy and more firm. Now I’m worried that it won’t hold up as well as the polyester. Also, I specifically didn’t get performance fabric, so I could wash the slipcover. Now I’m a bit worried that I’ll have a mess in my hands! Should I be? Do you know Pottery Barn’s guarantee for the slipcovers? Hi, Pam! I’m really not sure, as I’m not affiliated with Pottery Barn in any way. My sofas are a few years old now, so I can’t speak of their newest materials, unfortunately. I also don’t have the memory foam (I believe that’s a newer addition!). I think the best course for you would be to contact Pottery Barn’s customer service and ask. They are very responsive! Hey, Laura! I’m so glad that you haven’t had the slipcover woes. I think it must have been a bad batch with the first round because it’s been the same for me with the newer ones. That’s so strange that the frame broke! I catch my boys doing running leaps onto them all of the time and so far, so good. But we got them the IKEA sofa for the basement, just in case- haha! Awesome review! I noticed you mentioned you had an Arhaus sofa in the past. I am trying to decided between the two manufactures. 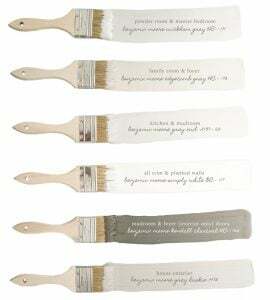 I was wondering, which did you prefer Arhaus or PB and why? Hi, Anna! I have a nursery rocking chair from Arhaus, not a sofa. So I can’t really speak to the quality of their sofas! I do love the rocking chair, but I’m not sure what may have changed in the past decade.